If someone asked you, “what’s the last thing you need right now”… well, you probably wouldn’t have a quick answer because that’s not a normal question. But we’re going to guess that if we answered “a broken down heater,” you’d agree! This is especially true if you’re a business owner and we’re talking about a broken down commercial heater. You have enough to worry about without being concerned with losing business because of an HVAC problem. But if you neglect repair needs, you could certainly find yourself with a broken down system. The good news is that we’re here to help if that does happen! In the meantime, we’d like to share some signs with you for you and your building’s occupants to watch out for. Should you become aware of these heating repair indicators, please give us a call right away so we can inspect and repair your system quickly. There are a number of symptoms you can come across with a commercial heater that are somewhat subtle. But cold air coming out of your vents when that heater is on is a pretty apparent sign something is wrong. In the absence of a thermostat malfunction, you could be dealing with a problem such as a fuel combustion issue, leaky ductwork, or perhaps even reduced airflow/loss of pressure that is presenting as lukewarm air. Chances are that any change in your energy bills may go unnoticed, depending on how high your overhead costs usually run each month. But we encourage you to specifically take a look at your energy costs this time of year. Are they significantly higher than they were this same time last year? If the weather doesn’t account for this contrast in use and there’s not a higher demand on your heater (i.e. fewer building occupants and less equipment could both account for more heat usage), then there is a good chance that your heating system simply isn’t working as efficiently or effectively as it once was and is in need of repair—or maybe even replacement. This should never be ignored. First off, depending on the nature of your commercial space, this could point to a number of different problems—an electrical issue, and overheating piece of office equipment, or a problem with your heater. Admittedly, it is normal to detect a slight burning odor right when the heater is turned on for the first time during the winter. This is because of dust burning off the heating elements and the smell making its way through your vents. This far into winter though, you should definitely not be smelling this. Please call us right away if you are. 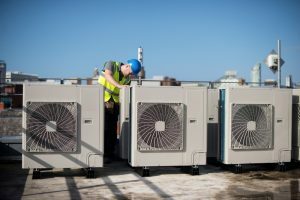 Even if it doesn’t end up being your HVAC system to blame, we can give you some direction in order to call in the right service professionals and ensure your commercial building’s safety. On that note, if it is a significantly strong and persistent burning smell, please call your local fire department. Shavitz Heating and Air Conditioning is your trusted resource for residential and commercial HVAC services throughout the greater Chicagoland area. Contact us today!